As CEO of Education Development Trust (former CfBT Education Trust), Steve leads an organisation that operates in diverse environments around the world to transform lives by improving education. Working with governments at national and regional level to improve education systems and with school clusters to raise standards, Steve manages an internationally based workforce in India, the Middle East, South East Asia, Africa, the UK and many other localities. CfBT is a charity and its commitment is to sustainable, high quality self-improving education systems. Steve began his career as a secondary school teacher in Birmingham, later moving to the north east of England where he worked as a teacher and then as a lecturer. In the late 1980s and the 1990s he worked in school improvement roles in Oldham and Blackburn with Darwen and from 2000 to 2005 he was director of education in Knowsley, Merseyside. 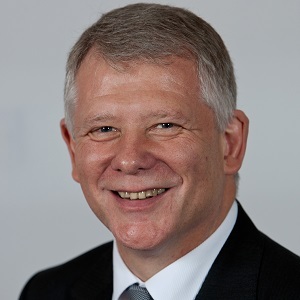 Steve was chief executive of the National College for School Leadership from March 2005 to November 2012. I think the leadership of hope is about the ability to help others to see how things can be better for the and for others. I think that’s a really important part of leadership. One of my heroes is a guy called Sir Tim Brighouse, he’s an educationist in England. He says there are four things you need if you want to lead change in a challenging circumstance. The first thing you need is you have to regard crisis as the norm and complexity as fun. The second thing is have a bottomless well of intellectual curiosity. The third thing you need is a complete absence of paranoia and self-pity. The fourth thing you need to have is unwarranted optimism. First, my boss at my first senior job in a local education authority in the UK, the director of education. I was struggling in that role and I felt I was letting my colleagues down. I went to resign and he said “resignation not accepted” because he believed in me. He knew I wasn’t doing well, but he believed in me. He was confident that I could get a lot better and as a result, I ended up being great at that job. Another great example of optimism and hope is Ernest Shackleton who led the expedition in Antarctica. There’s a point where they were shipwrecked and facing almost certain death. Every single one of them survived…. When I went to be director of education in Merseyside in the UK, I had responsibility for 80 schools and I was in charge. When I went there, we had the second worst examination results in the country. After a year of my leadership, we had the worst examination results in the country. That was a bad time for me as a leader. I went live on the local radio, radio at Merseyside and the broadcaster said to me, “with respect”, she said “with respect, why don’t you just give up? It’s hopeless.” A national newspaper, a very well-known national newspaper telephoned me and said they wanted to do a story about the worst local authority in the country, would I do an interview. Then in the local newspaper, The Liverpool Echo, there was a letter in there calling for my resignation because I brought disgrace upon the Borough of Knowsley. For me that was a time of despair. You might call that a dark night of the soul as a leader. I had to ask myself some tough questions whether I was up to this and whether I should resign or whether or not I was the right person and I needed more time. I came to a conclusion that I was doing the right thing – I just needed more time. I got all the head teachers together, all the school principals together in one room. I remember this clearly and I remember saying to them “In three years’ time, people will be coming from all over the country to find out how we had been so successful”. That proved to be the case. What was needed at that time was for me to come out of my dark night of the soul or my time of despair and just demonstrate optimistic leadership to those school leaders, to help them to believe that it was going to get better. That was crucial. That was optimistic leadership. I have the privilege to work all over the world. I believe that every child has the right to be a powerful learner wherever they are in the world. I believe in the power and effectiveness of education to help improve the lives of children and young people. In the work that I do, I have the privilege with my colleagues of bringing hope through education. (1) Learn and practice resilience and optimism. (2) Reflect on the things you have done wrong and see how you could use that to improve the future.